Start off at Baltimore City Hall, a magnificent Baroque Revival style structure located in the heart of downtown Balitmore. 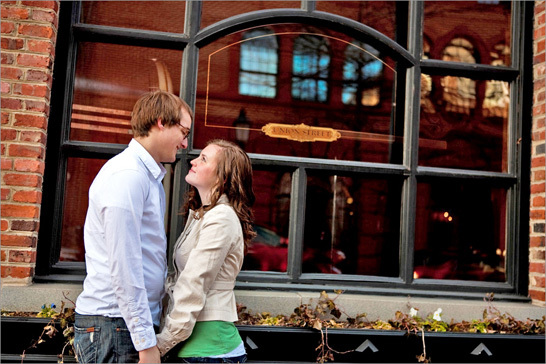 Have your engagement photographer take photos of you and your fiancée on the lush green lawn in front of the building. Your photographer can also arrange seated photos on the benches or beside the glimmering fountains in the front courtyard. Take some relaxed photos as you rest on the structure’s front steps, with the city hall’s immaculate marble exterior serving as a backdrop. Finally, have your photographer arrange an intimate portrait of you and your fiancée beneath the arched front entrance, in between ornate Greek columns. When you’ve finished at city hall, take a short walk over to the Walters Art Museum, located only a mile away on Centre Street. One of the most renowned museums in the country, the Walters Art Museum contains is home to an eclectic number of exhibitions, both in the geographic and chronological sense. However, it is the museum’s stunning architecture that makes a popular location for all kinds of photography. You and your fiancée can pose inside the museum along the suspended staircase, making for a beautiful engagement portrait. The spacious glass atrium is also a great place for you and your fiancée to pose, as you bathe in the sunlight that pours in through the glass ceiling. You can also have your engagement photographer arrange a portrait beneath one of the arches on the atrium’s balcony. Your and your fiancée will be amazed by the unique sites of downtown Baltimore! For the couple that loves exploring nature, Baltimore contains to some of the country’s most picturesque outdoor settings. Begin your outdoor photography session at Druid Hill Park, Baltimore’s most famous urban park. Take a leisurely stroll with your fiancée along the park’s countless pathways as your engagement photographer captures some candid photos. You and your man can also pose for photos beneath any of the large shade trees or relax on any of the park’s expansive verdant lawns. Finally, make your way toward the southern end of the park, where your photographer can snap some great shots with the tranquil Druid Lake in the background. One of Druid Hill Park’s most famous attractions is the Baltimore Conservatory, a Victorian architectural gem. Here, your engagement photographer can take photos around the exterior of the structure, with you and your fiancée surrounded by vibrant flora and lush greenery. You can also venture inside The Palm House, a five-story arched glass greenhouse that is home to tropical plant-life. Meanwhile, The Orchid Room contains a wide array of colorful flora that is in bloom all year long. The conservatory has three other unique greenhouses – the Tropical, Desert, and Mediterranean – which house the types of plant life suggested by their respective names. The Evergreen Museum and Library is one of Baltimore’s proudest architectural gems, as well as a national historic landmark. Formerly home to two generations of Baltimore’s wealthy Garrett family, the mansion is currently managed by Johns Hopkins University, which organizes guided tours year-round. To start off, your engagement photographer can arrange a portrait of you and your fiancée relaxing on the sprawling green lawn. Take some time to explore the estate’s expansive Italian-style gardens, stopping to pose for photos beneath the gigantic shade trees or using the surrounding greenery as a picturesque natural backdrop. Once you’ve finished exploring the gardens, walk toward the mansion, itself - an exemplary display of Gilded Age architecture from the mid-19th century. Have your engagement photographer organize a snapshot of you and your fiancée on the mansion’s front steps or along the balustrade. You and your man can also position yourselves for a portrait in front of the elegant entrance doors or beside one of the estate’s towering Corinthian columns. Other great photography spots one premises of the Evergreen House include the courtyard of the Bakst Theatre and the charming Carriage House. You’ll never forget your engagement photo shoot at Baltimore’s most renowned architectural landmark!